DARIEN — Comfort, convenience, and flexibility are just a few of the words that can be used to describe the gray contemporary colonial house at 2 Talmadge Hill Road, on a two-acre property in northern Darien. There is an abundance of comfort within its 10 rooms and 5,166 square feet of living space and continuing outside to the large, raised wrap-around wood deck and the covered patio below it. There is ample convenience because of its location. 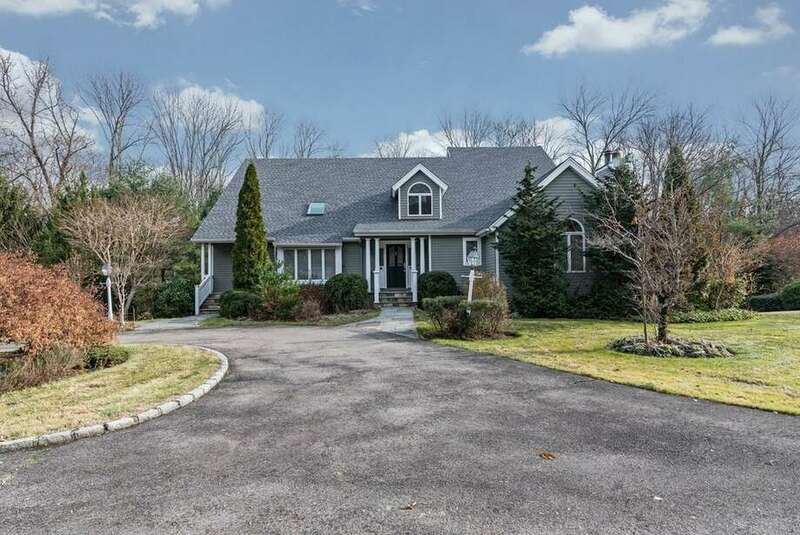 It is one of three homes on a friendly cul-de-sac on a corner lot with one side bordering Mansfield Avenue, and it has easy access to the Merritt Parkway, it is an easy commuting distance to the Talmadge Hill train station, and it is equidistant to the centers of Darien and New Canaan. The flexibility is evident in the floor plan of this house, which was built in 1984 but accommodates modern living. There is versatility to the rooms and how they are used. The full finished above-grade lower level offers space for living, entertaining and exercising but it also has a bedroom and full bath so it could be an au pair suite. And there are two master bedroom suites. The first is on the main living level and the other is on the second floor with two other bedrooms. That gives young parents the chance to choose where to sleep. They can remain on the second floor as their children grow up or maybe they would prefer the main level master for privacy sake. Either way, they can age in place moving down to the first floor master, if necessary, or they perhaps they would want to invite aging parents to move in with them. The approach to the house can be from the circular driveway to the covered front entrance or through the attached three-car, under house garage, which requires stairs to climb to the main living level. The front door opens into spacious and attractive two-story foyer, which has an eye-catching staircase with decorative wrought iron balusters. Inside, many of the rooms have vaulted ceilings and the baths have all been updated with sleek features imported from Italy. To the right is the family room, which has a fireplace, and to the left is the formal dining room. In the formal living room, straight ahead as one enters the house, there is a fireplace and sliding doors to the deck. The dining room has chair railing, a skylight, and a hand-painted mural on one wall. In the updated state-of-the-art gourmet, eat-in kitchen there is a center island with a built-in wine rack, Calacatta marble counters with a beveled edge, a marble tile backsplash in a basket-weave pattern, and high-end appliances including a Sub-Zero refrigerator. In the breakfast dining area there are French doors to the deck. The first floor master suite features two walk-in closets, a huge bath, and sliding doors to a private balcony. The upstairs master also has a door to a balcony. The two other bedrooms on that level share a Jack-and-Jill-style bath. One of those bedrooms has a door to its own balcony as well. On the lower level there is a secondary foyer with a marble tile floor from the garage into the living space. This level contains a second family room in addition to the bedroom, full bath, and sizable exercise room. In the garage there is a workshop. For more information or to make an appointment to see the house contact Amy Barsanti of William Pitt Sotheby’s International Realty at 203-722-1781 or abarsanti@williampitt.com.